They bring it out, issran, we put our food in here, the grass, greens. All kinds of greens we put them in here, put our food in here, until it’s very, very full… It’s very heavy, very heavy. 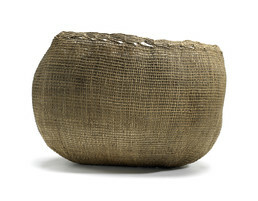 A woven burden basket (issran) like this was used with a back strap and wooden chest yoke for gathering plant foods and grasses on the tundra. It has woven “eyes” along the rim. Strong taperrnaq, or seashore grass, was used for weaving baskets.